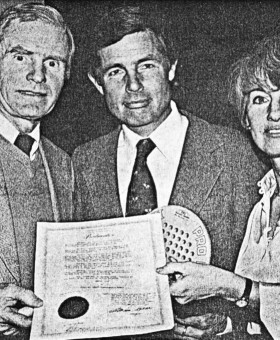 As a three-time National champion and as an APTA administrator Gloria Dillenbeck Dodd made many contributions to the sport, both on and off the court. Dodd reached the finals of five National Championships between 1969 and 1974, winning three titles in a row from 1971-1973. Her partner each time was B.J .Debree. Gloria also teamed up with John Mangan to reach the finals of the Mixed Nationals twice, in 1974 and 1975. As the APTA’s first Executive Director from 1975 to 1981, Gloria defined the new position by her performance, and set high standards for her successors. Her efforts in promoting platform tennis have been rivaled by few. 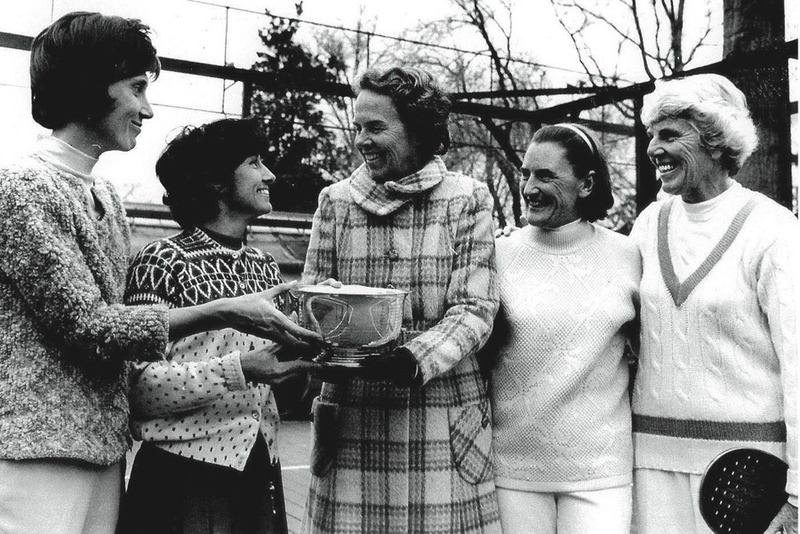 Dodd started swinging a tennis racquet early and, as a teenager, she was ranked nationally in the 15-and-unders, and in the top 15 among all women players. She also tried badminton and brought home a national mixed championship. At an early age, she also had to choose between her love of the court and her love of the stage. Dance and theater were also passions, and she began to dance at five. She auditioned for George Balanchine and was accepted to the New York City Center Dance Company. However, the demands of the program conflicted with her other passion, tennis. Luckily for the game and the APTA, she opted to put aside dancing and concentrate on tennis. As a Swarthmore undergraduate, she was Middle States Intercollegiate tennis champion in three of her four years. She still managed to pursue her interest in the arts at college, but this time it was in television. She hosted her own daily TV show, The Magic Lady, on ABC affiliate WFIL. Later on, she had lead parts in Junior League Children’s Theater and Montclair Dramatic Club shows. Dodd became one of the game’s dominant players, thanks to her wide range of shot making abilities. Her colorful and vibrant personality, and her ability to battle it out were key factors to her on court successes, and also made her a great ambassador for the game. She worked non-stop in her quest to expose newcomers to the game and get important, high profile and generous people to be a part of it, even recruiting then New Jersey Governor Brendan Byrne to participate in an event! The R. J. Reilly Company sponsored her to play in exhibitions and provide instruction at new courts on club rooftops overlooking the Pacific. When a club in Guilford (UK) asked her to bring a group to play a mini-tournament on their new courts to show their members how the game ought to be played, she gladly went abroad, and ended up also making a three-part instructional video for the BBC while she was there. Gloria also helped get the game started in Holland when she hosted Nico de Wal, the President of the Bellfires Corporation, at an APTA exhibition event on a Reilly court at Forest Hills in 1976. (wasn’t this the Tribuno Tournament? )After the match, de Wal agreed to build two courts and, when they were constructed in Hapert (near Eindhoven), he invited Dodd to bring a mixed group of sixteen top players to Eindhoven as guests of Bellfires to teach the game to some of the high-ranking Dutch tennis players. As Executive Director, Gloria served the APTA at a time when major changes were occurring in the sport. Some of these changes were controversial at the time, but most of them turned out to be milestones in the growth of the sport. One change involved the decision to divide the country into paddle regions, and then add representatives from these new regions to the board. Another was her insistence in showcasing the game, taking it to Hilton Head and Amelia Islands, as well as to a Manhattan street comer and to a high school gymnasium in New Canaan, CT. This exposure led to the “professional era” in paddle, where tournament sponsorship led to prize money which, in turn, drew a whole new group to the game: highly skilled tennis and squash players who were able to pick up the nuances of platform tennis quickly—and who oftentimes, picked up the prize money as well! In the aftermath of these changes many were concerned about the amateurs being left behind in this new era. These concerns were lessened thanks to the joint efforts of the APTA and Gloria in creating the Presidents’ Cup, a year-ending competition that has been extremely popular ever since. Dodd had a passion for Bingo and, for quite some time, one APTA president was perplexed at her request that she “had to go and run Bingo in the park.” Was she doubling as operator of a bingo parlor? No, Bingo was the family dog. Ethel Kennedy (center) presents the trophy at a tournament in Chevy Chase, Maryland, to (from left) B. J. Debree, Gloria Dillenbeck, Peggy Stanton, and Charlotte Lee.